Someday, I’d like to play King Arthur in a production of Lerner and Loewe’s Camelot. I long ago memorized all of Arthur’s songs and a lot of his dialogue—including the show’s last scene. Maybe you know it; it’s a beautiful moment. As Arthur prepares for what will be his last battle, he discovers a boy in hiding, hoping to fight at the king’s side. Arthur knights the boy, but orders him to leave and live a long, full life, telling everyone stories of the Round Table and its quest for honor, justice, and peace. “Don’t let it be forgot,” Arthur sings, “that once there was a spot, for one brief shining moment…” The boy, named Tom, runs back home to Warwick to obey his king’s command. With that moment (taken from its source material, T.H. White’s The Once and Future King), Camelot makes Sir Thomas Malory, of Newbold Revel in Warwickshire, a character in the legends that he, arguably more than any other author, made famous. The Arthurian content in Geoffrey of Monmouth’s Historia was mostly military. But through the next three centuries, King Arthur started drawing other kinds of tales into his orbit, in England and abroad. In France, the verse romances of Chrétien de Troyes envisioned Camelot (a place first mentioned by him) as a scene of courtly love. He introduced Lancelot—King Arthur’s greatest knight, Queen Guenevere’s devoted paramour—to the legend’s cast of characters. And in Germany, the singing poet Wolfram von Eschenbach composed Parzival, an epic continuation and conclusion of Chrétien’s unfinished story of the Holy Grail, and a work that may have bolstered the Knights Templar. Malory didn’t create the Arthurian story we know today—in fact, only one short tale in his book seems to be completely original—but he did craft it, artfully shaping a myriad of stories into one largely continuous and coherent narrative, a “whole book of King Arthur” (as Malory himself called it). 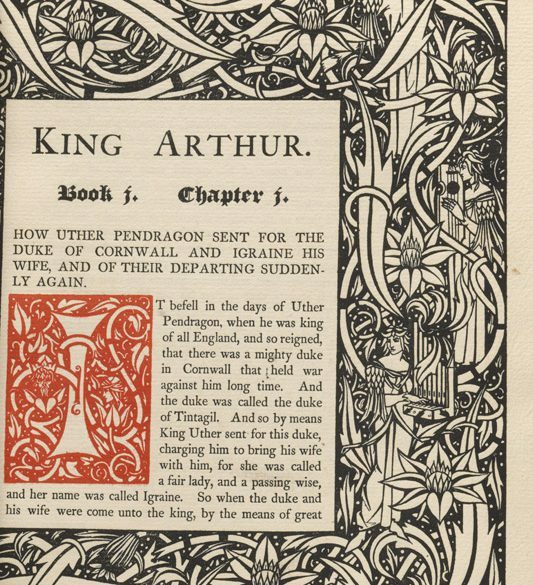 The “only true English epic” (Printing and the Mind of Man), Le Morte Darthur established itself as the definitive Arthurian plot for centuries. It remains the chief exemplar of Western literature’s chivalric tradition. I pray you all, gentlemen and gentlewomen, that read this book of Arthur and his knights from the beginning to the ending, pray for me while I am alive that God send me good deliverance, and when I am dead, I pray you all pray for my soul. But if any political agenda motivated Malory, it remains a marginal concern. He loved the legends for their color, their drama, and their high ideals—the same reasons his readers love them, and his recounting of them, more than five centuries later. Rare book collectors sometimes speak of “holy grails”—books that are elusive but, in theory, obtainable. 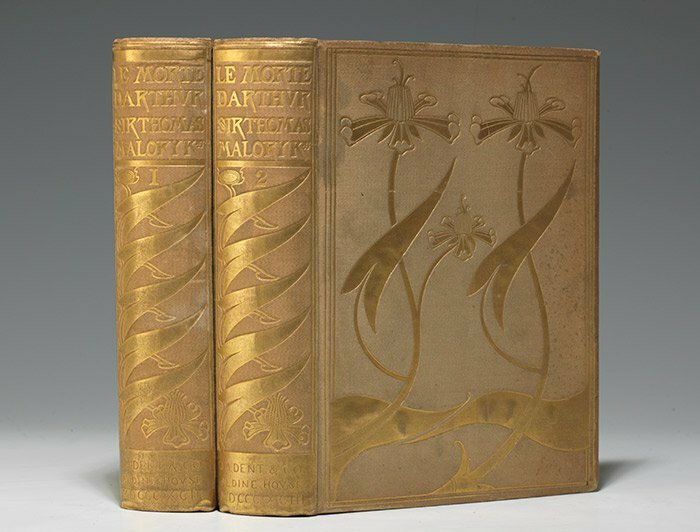 Sadly, the first edition of Malory’s Morte is even harder to achieve than the Grail. Not even the most pure-hearted bibliophile can hope to acquire one; only two known copies exist. But you can add other versions of it to your Arthurian library, from handsomely bound modern renderings to elegant, artistic editions important in their own right. What that reviewer failed to recognize, or recognized and rejected, was Beardsley’s implicit critique of the same chivalric ideals Malory’s text celebrates. In drawing damsels and knights who, despite elegant curves and elaborate floral motifs, are fading away into nothingness—in shading the Morte with (as our own Embry Clark has noted) “a sinister element… over-sexed satyrs, sneering mouths, looming death”—Beardsley makes the same point with his pictures that Tennyson, in his Idylls of the King, makes with words: overreaching idealism often contains the seeds of its own doom. Despite (or perhaps because of) the tension between Malory’s text and Beardsley’s pictures, the Dent Morte won the artist instant acclaim. 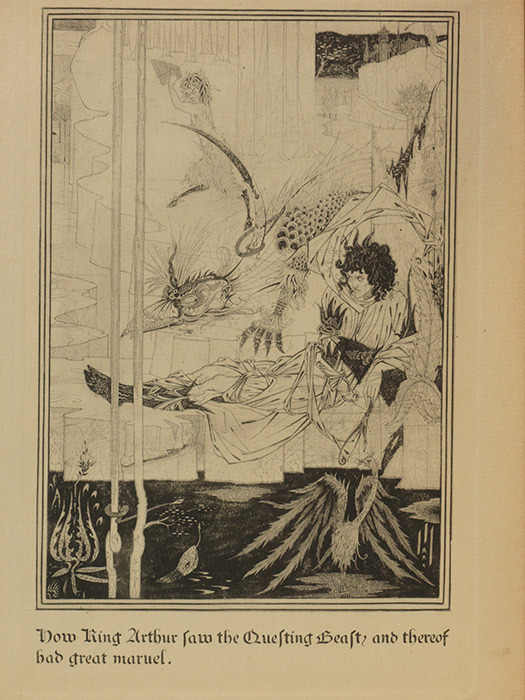 These illustrations endure as the strongest of Beardsley’s too-brief career; he died of tuberculosis four years later. Triumph and tragedy, horror and hope, are often entangled in Arthurian legend. Perhaps that’s one reason it continues to fascinate us. We recognize those struggles of light and shadow, good and evil, birth and death, as our own. 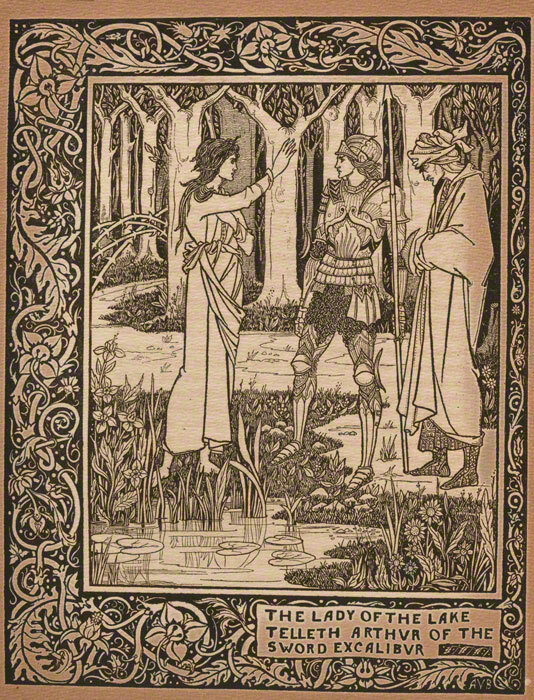 Malory, Beardsley, and countless other Arthurian storytellers faced those struggles, as well. Their experiences infuse their narrative and visual art, ensuring that Arthur’s plea in Camelot’s last scene is not in vain. We’ll never forget the “one, brief, shining moment” at the heart of Le Morte Darthur—and we’ll go on looking to glimpse it again. What is your favorite story from the Arthurian legends? Let us know in the comments below! Mike has worked as a cataloguer in the Philadelphia office since 2004. 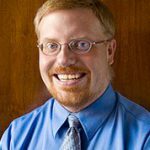 He especially enjoys working with our acquisitions in children’s literature, science fiction and fantasy, and religion. He holds a B.A. in English and Religious Studies from the College of William & Mary, and a Master of Divinity from Princeton Theological Seminary. ¡Genial post! Mi historia favorita de la leyenda artúrica, es la de Tristán e Isolda. Mariana, gracias por leer, y por tu comentario. La historia de Tristan es otro buen ejemplo de las tradiciones que se inició de forma independiente del rey Arturo , pero encontró su camino a Camelot en el final. Una vez Malory utiliza Tristan y Isolda en paralelo Lancelot y Guinevere , creo que los dos cuentos se hicieron inseparables . ¿Tiene una versión favorita de la leyenda de Tristán?